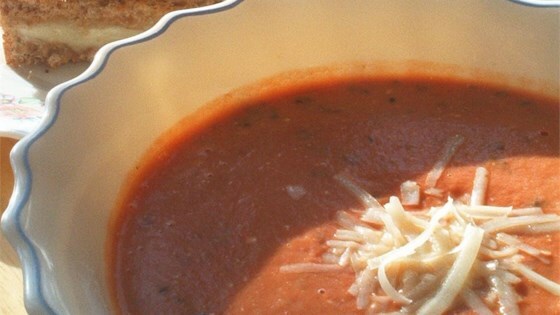 "Nothing's more comforting than grilled cheese and tomato soup. This is a gussied-up version, with grilled Brie cheese sandwiches and spiced tomato bisque with basil. As the soup soaks into the sandwich, break into pieces with your spoon and ladle up with the soup." Preheat the oven or a toaster oven to 400 degrees F (200 degrees C). Spread the Brie cheese onto two slices of bread, and top with remaining slices. Place on a baking sheet and toast in the oven for about 8 minutes, turning once halfway through. Cut in half, and set aside. In a saucepan over medium heat, stir together the tomato puree, red pepper flakes, black pepper, basil, and sugar. Bring to a simmer, and cook for 10 minutes. Whisk in the cream cheese until well blended, then stir in the milk. Heat through without bringing to a boil. Stir in the fresh basil, and remove from the heat. To serve, place each sandwich half into a separate bowl. Ladle soup over each one into the bowl. Serve immediately. Watch Chef John make tomato soup’s richer, silkier cousin. This was good, fast and easy. I used two 14oz cans of tomato sauce and diced tomatoes because I did not have puree on hand and the texture was great. I'm not a fan of rye bread, but I thought it was pretty good paired with the Brie. The soup, however, wasn't nice at all. I'd try this again but make my own tomato soup from scratch. I used the variation given by the last review, 2 14oz cans tomato sauce and one can diced tomatoes instead of the puree. It Was EXCELLENT!! Fantastic! Quick, easy, and delicious! I too used the sauce/diced variation and it came out fabulously! I made the soup but not the sandwich. The soup is great. I cut down on the amount of cream cheese and left out the milk entirely. Very good. Pure comfort food!! My family and I loved this! I doubled all the proportions and used fat-free cream cheese, but kept everything else the same.